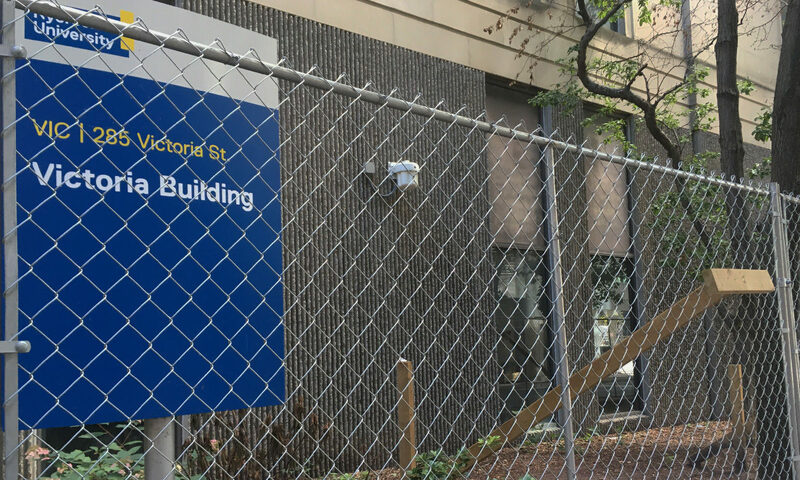 The fence surrounding parts of the Victoria Building has been erected for security purposes after Ryerson staff and students complained of disruptions related to the safe-injection site next door. The Victoria Building sits adjacent to The Works, a supervised injection site that opened in 2017. Security incidents in the area, including robbery and assault, have been recorded by Ryerson security. According to Kim Bailey, director of community outreach and community engagement and partnership for the Faculty of Community Services, Ryerson is mindful of the needs of the community, but has a responsibility to address student safety. Bailey said the number of people using the services at The Works is higher than what was anticipated. She said the desire from the drug using community to be close to a facility trained to handle overdoses is only one of the factors contributing to the activity on the corner of Victoria and Dundas streets. 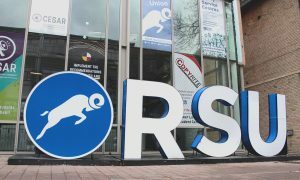 “A lot of times addiction interfaces with mental health issues and homelessness so a lot of what we see at that entranceway where (Ryerson and The Works) come together is the result of various social problems,” she said. Bailey said these factors cause perceived and real security threats that need to be addressed. The fence blocks off a flower bed area where staff and students said people presumably associated with the supervised injection site were congregating. “While the fence is a very stark intervention … the alternative of letting people sit in a corner of mud doesn’t seem like the goal to me either,” said Bailey. The area around the Victoria Building will be renovated as part of the Campus Public Realm Plan. Under that plan, the sidewalk will be levelled and widened and trees will be planted in the area. The plan does not specify when this construction is slated to begin. “We want our campus to remain a people-friendly, safe, and inclusive environment, not just for students, but for all community members,” said a spokesperson for Ryerson in an email. Bailey said she hopes the university will collaborate with people who use the safe injection services, in addition to other community partners, to create a space that is welcoming for all. “We do pride ourselves at Ryerson for being a place of innovation and city building and this is a really amazing opportunity to do just that,” she said.